As a practical matter, the ever-shorter days of autumn -- for most of us -- offer only modest inconvenience. Once the sun has dipped beyond the horizon, we instinctively reach for the "on" switch, illuminating our evenings and nights so that we can extend our waking hours beyond the sun's. But for many, many people in developing countries -- including an estimated 1.3 billion children who live without electricity -- their days are constrained to the hours of sunlight, largely immobilized by the setting sun. For the world's poorest people, light is as much a currency as arable land and clean water, and often is just as difficult to come by. With no electricity, there are few options that are safe and affordable. The most popular source of light among families throughout the developing world is the kerosene lamp, an anachronistic device that I grew to both rely on and loathe during my younger days as a Peace Corps volunteer. Filling the tin tanks with the flammable liquid was not only messy, but dangerous. Kerosene lamps cause over one million house fires annually, and their fumes are toxic, causing dizziness and blurred vision. Inhaling kerosene is said to be the equivalent of smoking two packs of cigarettes a day. The lamps are no doubt a contributing factor to the more than two million deaths each year in developing countries from indoor air pollution. Even with these dangers and adverse health consequences -- and despite the cost of kerosene which can consume as much as 30 percent of a family's income -- the use of kerosene lamps is widespread. It is what enables children to continue their studies into the evenings and provides illumination for other family activities. For most people, the alternative to kerosene is darkness. But there is a new light at the end of the tunnel. Through a partnership with Nokero, a Denver-based company whose name is short for "No Kerosene," ChildFund has launched the "Light to Learn" initiative. Through "Light to Learn," ChildFund and Nokero are distributing solar-powered light bulbs to millions of children in rural communities. The Nokero light bulbs can provide up to 15 continuous hours of light and then can be recharged by way of the sun. Not only are the Nokero lights eco-friendly, but they are much healthier and safer than using kerosene. Over the past two years, a survey of 10-to-12-year-olds conducted by ChildFund in dozens of developing countries found that children all over the world put a premium on their education. They want a better education and aspire to pursue professions that require a college education. The "Light to Learn" project will give them a better opportunity to reach their full potential, by enabling them to extend their studies into the evening. Give a child a Nokero light, and watch her smile light up. Solar lights, because of their portable nature, are also helping provide important safety benefits. Parents and children can now walk more securely after dark, which gives them the capacity to work, play and study in places sufficiently far away that they could not return before nightfall. 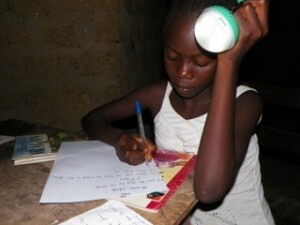 Even night-time trips to the latrine, especially for girls, are possible using the Nokero lights. It's why the Clinton Global Initiative also has embraced solar lights as a way to illuminate refugee camps. Technology is often held up as panacea for all that ails the developing world, but technological solutions, despite all their promise and good intentions, often come with many complicating challenges that limit their effectiveness and reach. But the Nokero solar light bulbs are the happy exception. Because this initiative does not require a significant upfront investment, because it is easily scalable and does not require major changes to the existing infrastructure, we are already seeing this program make a meaningful difference on a human level. Our thanks to our friends at Nokero for showing us the light.